Millions of Americans have lost one or more of their natural teeth. By one count, nearly seventy percent of adults have lost at least one. At Koch Park Dental in Florissant we offer several options to those patients interested in tooth replacement. 1. Dentures are not the only choice for missing teeth. Dental implants used alone or in combination with a partial denture is often a preferable option for patients. Whereas a removable appliance replaces only the visible parts of teeth, an implant replaces both the root and crown of a tooth. This has critical implications. Dental implants can prevent bone recession that typically occurs following tooth extractions. Dental implants can furnish patients the near-normal ability to chew and speak. 2. There is more than one type of denture. Most people are familiar with the removable denture that replaces a complete upper or lower arch. There are also partial dentures that are used for patients who have some remaining teeth. Partial dentures can be fixed in the mouth or detachable. 3. Even if you have worn dentures for a while, you may be a good candidate for implant-anchored dentures. The essential factor is whether you have enough bone to support an implant. Bone grafting can augment natural bone in some patients. 4. Regardless of your tooth replacement configuration—full dentures, partial dentures, or tooth implants—you still need to practice correct oral hygiene. Removable appliances should be cleaned daily. 5. Even if you have no natural teeth left, it’s indispensable that you have twice-yearly dental examination. Optimal oral health is an integral component of overall physical well-being. We will examine your mouth for indications of diseases like cancer, heart disease, kidney disease, and diabetes. At Koch Park Dental in Florrisant, we offer conventional dentures and also practice implant dentistry. Call our office to schedule an appointment with us today. Do you have extreme tooth damage, bone loss, or few or no teeth still intact? This dental health post from Koch Dental is for St. Louis area residents whose mouths are in a world of hurt. First off, we feel for you. We understand how severe dental troubles affect you every day of your life. Full mouth reconstruction can restore your previously healthy, attractive smile or give you the remarkable smile you never had. Patients who undergo full mouth reconstruction regain their confidence to smile, eat, and speak normally. How would that impact your life? Replacing missing teeth and adding bone through grafting restores underlying facial structure, improving or preventing that “sunk-in” look that develops when teeth are gone and the jawbone recedes. Full mouth reconstruction (sometimes called full mouth restoration) is a term which refers to a combination of dental procedures that restore a smile for people with several damaged or missing teeth. Treatment may include any combination of the following procedures: crowns, inlays/onlays, dental bonding, white filling replacement, tooth implants, porcelain veneers, implant-anchored dentures, gum contouring, soft tissue grafts, bone grafts, and tooth whitening. Dental implants are ordinarily the best tooth replacement for patients with missing teeth. A dental implant consists of a titanium post surgically inserted into the jaw bone to replace the root of the missing tooth. If there is not enough bone to anchor an implant, bone grafting may be completed to augment existing bone. The post integrates with the bone to provide a secure foundation for the abutment and beautiful crown. Dental implants are indistinguishable from previous teeth in both form and function. 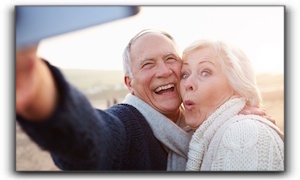 If you currently have dentures, ask us about implant-anchored full or partial dentures. 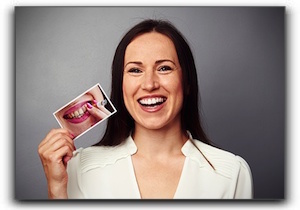 Significant improvements can be made even if you only get two or three tooth implants. Crowns (sometimes called caps) are used when there is enough viable tooth structure that the tooth doesn’t need to be extracted. A crown adds strength to a tooth that has a large filling or has been injured. A crown can repair a bite misalignment and is usually necessary after a root canal. 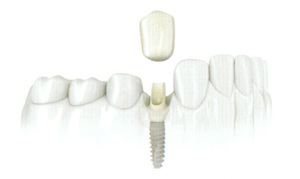 In a dental implant procedure, attaching the crown to the abutment is the final step. Koch Park Dental in Florissant offers a full menu of cosmetic dental services. Schedule an appointment today. At Koch Park Dental in Florissant, we welcome patients of all ages. We’re pleased to see that older Americans are having fewer cavities than they used to, but concerned that about twenty-five percent of those above sixty-five have lost all their teeth, and need dentures. 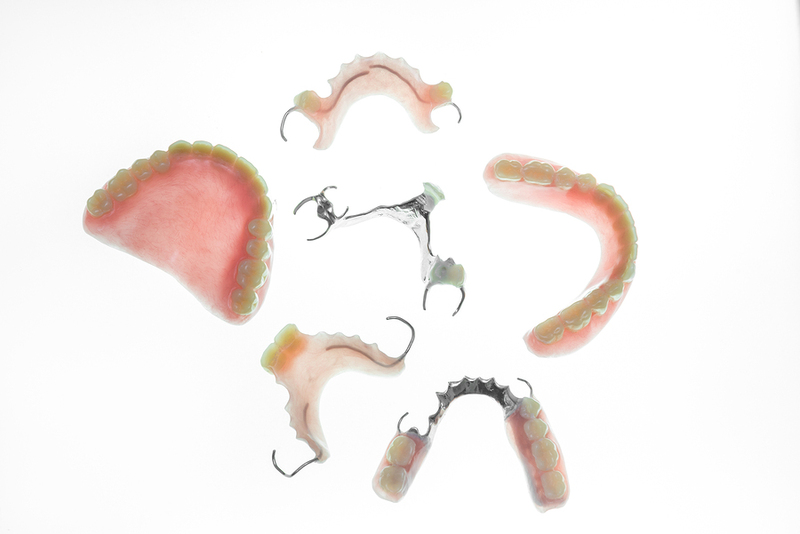 Patients who have lost all of their teeth are usually looking for dentures: removable, custom-made replacement teeth. Traditional dentures never feel like natural teeth, of course, and they take some getting used to. But they help to improve your appearance and smile, and to eat and even speak more comfortably. An increasingly popular option for denture-wearers are All-on-4 dental implants. In this procedure, four titanium posts are surgically implanted into the patient’s jaw, and used to support a set of artificial teeth. Anyone who has lost all of their teeth and wants to have a permanent, natural-looking set of dentures will benefit from All-on-4 implants. One of the things that patients love most about them is that they can eat whatever they want to, without worry of slippage. 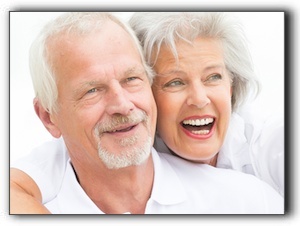 Koch Park Dental in Florissant provides both traditional dentures, and All-on-4 dental implants. Contact our office to find out more. We also provide general and cosmetic dentistry. Schedule an appointment with us today.